Penn's Landing Waterfront Day, a new event for 2017, will take place over Memorial Day weekend. 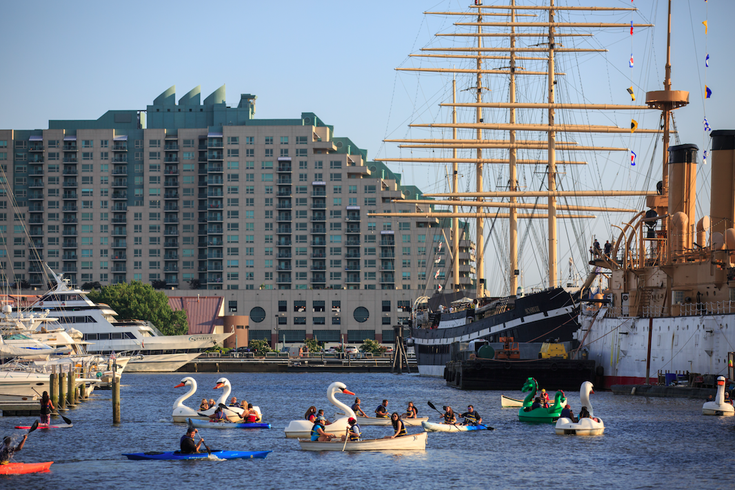 On Sunday, May 28, Philadelphians are invited to spend a day at the Delaware River waterfront. Leading the day's festivities will be the Spirit of Philadelphia. The cruise ship will open a pop-up beer garden for the 21-plus crowd on the rooftop of the docked boat from 2:30-5:30 p.m. There will be a cash bar, lawn games, complimentary bites and music. Then, at night, the Spirit of Philadelphia will set sail for the Memorial Day weekend fireworks dinner cruise. Secure a spot aboard for up-close views of nighttime fireworks over the Delaware. The show starts at 9:30 p.m. and can be watched for free from Penn's Landing. Before, the United States Air Force Band will perform. There will also be deals at many waterfront attractions on May 28. Independence Seaport Museum will offer paddle boat rental and museum admission for $20 (kids $16). Battleship New Jersey will host hourly raffles for a chance to fire the ship's gun. Patriot Harbor Lines will offer half-off tours from noon to 5 p.m. All day, there will be $3-off skating admission at Blue Cross RiverRink Summerfest. Mention "Waterfront Day" at Franklin Fountain's Spruce Street Harbor Park location and receive 10 percent off ice cream floats.